This entry was posted	on Friday, August 27th, 2010 at 3:04 pm	and is filed under Decapods!, Nature, neverbeengood. You can follow any responses to this entry through the RSS 2.0 feed. You can leave a response, or trackback from your own site. Very saddening. Crabs are known to be resilient creatures, not ones to give up the ghost and die young. I think you can do a quick investigation and make sure such a tragedy doesn’t reoccur. Firstly, moulting is a common phenomenon in crabs, i doubt pulsar died because of that. May be a post-moult infection, then again worst case. Anyways, moulting related cause is very remote. Crab battles, in worst case when food/mate is in short could turn this serious. I am assuming you are feeding them regularly and sufficiently so fights this serious can be counted out. Coming to the mate issue, i think these crabs are pretty young to be thinking about it. Now, since nothing adds up…i have a feeling that the Ph in your tank is haywire! only that could be this catastrophic. If this is the case, then Nebula might be in some trouble too. Thanks for you comment. With regards to pH, carbonate hardness, nitrite and nitrate levels, everything is in check, and I test regularly, so I don’t think it’s that. 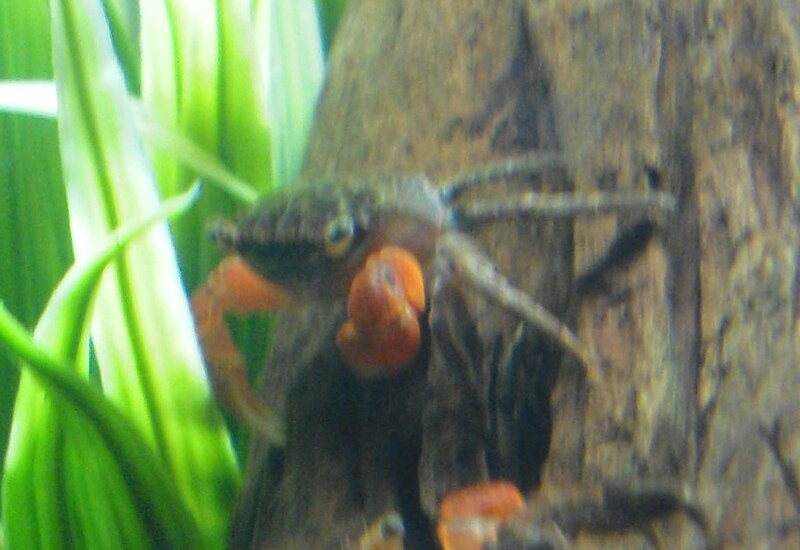 Obviously moulting is indeed common, but many resources I use and read say that moulting is arguably the most stressful tiem of a crabsd life, and they may indeed die from that stress – but again I’m not convinced it was that, as he didn’t look mid-moult. Not sure if you saw my earlier posts, but he lost two legs since I got him, which I thought was down to battles, given the way Nebula tended to bully him if they were in the same bit of the tank. As far as I could, I was making sure that food was distributed in both territories, so he got a fair chance food wise. It’s possible he was already sick. I did see him sometimes hanging in the faux plant in there and opening up his tail – I’m not sure what this behaviour is and I’d like to know. I was hoping that it had some significance to moulting, so he would hopefully regain a leg or two (they were budding). either way, I found him on the saturday, belly-up, with his tail open and a small white bit of innards – which didn’t look right. It could have been battles after all. I left him for a while, he did move one leg very slowly once, but afte a while I realised he was definitely gone. Poor little guy.